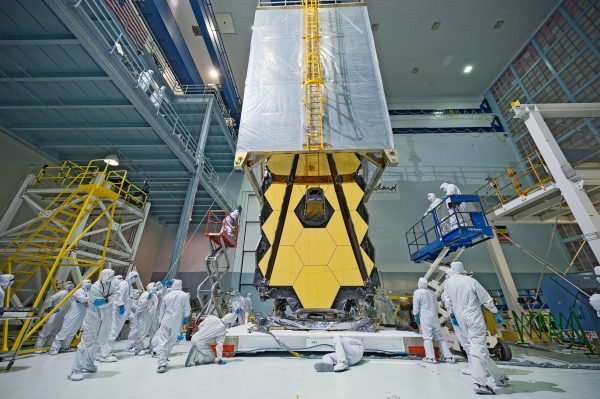 Hubble’s successor, the James Webb Space Telescope (JWST) is complete. It still has to undergo a battery of tests before its launch end 2018. The capacities of this instrument in the field of planetology are such that several astronomers of PlanetS are already planning time demands. “We can break through the clouds and analyze the atmospheres of exoplanets,” David Ehrenreich’s enthusiasm is communicative, “JWST will tell us if there is water, water vapor or oxygen. Thanks to the presence of these biomarkers we will finally know if life is possible elsewhere than on Earth, “adds the astronomer member of PlanetS. End 2018 is already tomorrow, “we have to be ready when the time of observation allocation will be put into contest” ensures David Ehrenreich. His colleague Vincent Bourrier, also member of PlanetS agrees: “we have already obtained telescope time on Hubble, but with JWST things will be very different because it is dedicated to observation in the Infrared”. It is certainly not the first time that an astronomical satellite dedicated to Infrared is sent into space, like Spitzer or Herschel for example, but the difference between them and JWST is the cooling system. While the previous satellites were cooled by the evaporation of liquid helium or hydrogen, JWST is protected from radiation by a shield. As a result, it does not need to carry helium, which makes it lighter and allows a longer operating life. The mission must last 5.5 years, a relatively short mission compared to that of Hubble (in operation since 1990). However, if the money is available, the mission could be extended by 4.5 years leading the longevity of the satellite to 10 years. In Bern, Brice-Olivier Demory, associated with PlanetS, is also looking forward to the commissioning of JWST. However, the astronomer remains cautious, “a demand for time will represent a major effort and investment, ideally we should join forces within PlanetS between Bern, Geneva and Zurich, as the competition will be tough.” Drawing on their experience with Hubble, the Americans of STScI are already encouraging astronomers to think about JWST, forming interest groups or offering meetings. “One of the privileged targets will surely be Trappist-1 and its seven planets,” says Brice-Olivier Demory, “if one of them has an atmosphere, then we will have the opportunity to do the chemical analysis.” But it is not only the rocky planets that will interest astronomers, “in cloudy atmospheres such as Jupiter’s, for example, the most interesting part is under the clouds” explains David Ehrenreich, “with JWST one can then drill these clouds and perhaps detect water vapor”. Detection of water vapor is paramount, if it can be done on giant exoplanets such as hot Jupiters, it will be possible to recognize it on smaller planets. “This detection is far from trivial,” said David Ehrenreich,”we had to send the Juno probe to our Jupiter to be able to do this measurement,” adds the PlanetS astronomer. The JWST saga is coming to an end, imagined in 1996 with a diameter of 8m for a budget of 500 million dollars, it has been reduced to 6.5m in 2000 for a price exceeding one billion dollars. Its construction began in 2004 to end this year with a cost of 8.5 billion. The Europeans will pay their share by launching it in October 2018, granting them 15% of the available telescope time.